Circa 1803. Sheltered by weeping cherry trees with an apple and fruit orchard in the back, this elegantly restored Colonial home is filled with exquisite antiques. The original lockboxes remain on all doors. Gather by the fire in the parlor or dining room. After a comfortable nights rest in one of the guest bedrooms, savor breakfast favorites like Peach Toast, Ginger Scones and Creme Brulee French Toast. Relax on the multi-pillared wraparound porch. The property is surrounded by stone walls and a flowering landscape with ample places to sit and soak up the scenic beauty. Visit nearby Storm King Arts Center, the country's largest outdoor sculpture park or relive our nation's history; many sites are within 15 minutes. This property has 14 total guest accommodations with private bath, 10 with fireplaces, 8 with hot tubs, 8 with whirlpools, 3 guest houses and 3 conference rooms. The types of beds available include King and Queen. 75 inch 4K HDTV for presentations. Vast solar array in back yard powers most of the property. Electronic temp controls. Recycle and compost. Select Registry, Diamond Collection,PAII, ESBBA, AH&LA, NYSHTA, AIHP, Greater Cornwall Chamber of Commerce. Eight landscaped acres with lovely plantings, towering trees, private gardens, and a creek side sitting area. Ten days prior to arrival, refund will be made minus a $50 service charge. After that date the total amount is non refundable. 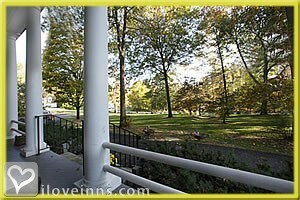 2010, 2009 and 2009 Voted Best Bed and Breakfast in the Hudson Valley, by readers of Hudson Valley Magazine. My first B&B and I LOVED it! My boyfriend and I stayed at the Caldwell House last weekend for 2 nights. I have one word for our entire experience...PERFECT!!! 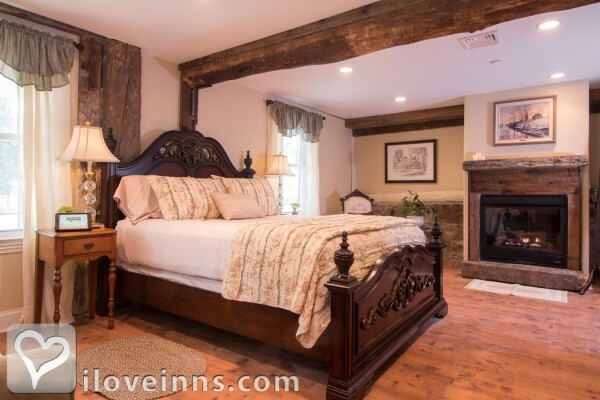 We stayed in the Storm King room in the Carriage House and it was a large room with a ridiculously big bathroom and we loved that they had the original stone and wood beams from when it was a carriage house back in the 1800's. We sat on the outside porch at sunset with a bottle of wine and just took it all in. We never wanted to leave the room, it was that beautiful. John and Dena were such gracious hosts. Dena was so accommodating with our no-carb diet. Next time, we are eating EVERYTHING because her cooking was delish and the baked products that we couldn't eat, looked amazing! There are so many places to sit in a quiet setting on their beautiful grounds. The Carriage House had a shared kitchen with everything you could possibly need with complimentary coffee, snacks, games, a microwave and even a huge refrigerator if you want to bring some goods yourself, which we did. It is so close to the Brotherhood Winery, which was great and The Storm King Art Center, which was amazing...both within a few miles from the B&B. I was very sad when eating breakfast Sunday morning knowing we were going to leave, but we decided we will DEFINITELY be back every year, if not more often. Thanks again, for such a great stay!!! Perfect choice in Hudson Valley. I would definitely return to this beautiful and friendly bed and breackfast. It is ideally located within the valley and a few minutes from Storm King Art Center park. The attention of John and Dena was very pleasant. The Caldwell House B&B is like taking a step back in time to another era. 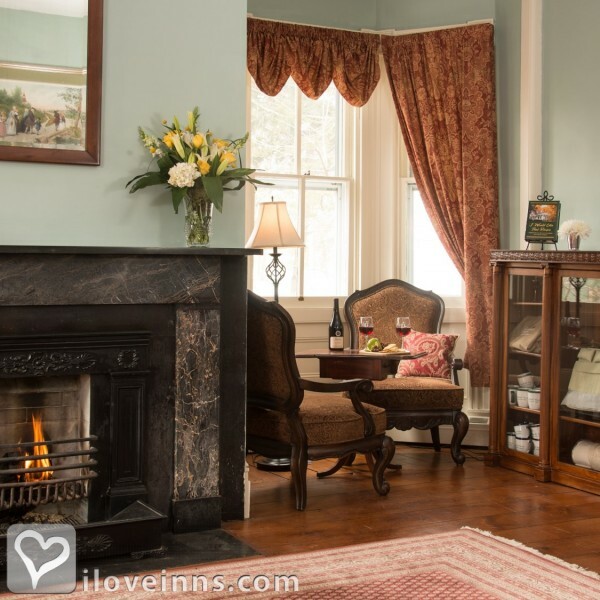 Inside the Inn you feel the historic significance of staying in a quaint country inn. John and Dena, the Innkeepers, are warmhearted hosts who make sure you feel right at home from the moment you meet them. Breakfast is a real treat, with down home style cooking that we love. Next time we're in this area of NY, we will be staying here for another weekend adventure. John and Dena are wonderful! The rooms are perfect and the location gives easy access to the whole valley. We come back every chance we get! Four times and counting. You can't get a better review than that. Warm, friendly and welcoming, we were very pleased by our stay at the Caldwell House Bed & Breakfast. I loved the decor, the furnishings, and the crackling fire that greeted us when we first walked in. The deep jacuzzi tub was a treat and when we closed the door to our room we felt we were a world away from the everyday. Our hosts Gene and Carmela made us feel so welcome and we enjoyed the tour of the house. A very special place and I hope to return before too long. The house is nicely recessed back from the roadway with treed front yard. It is beautiful inside and out. After a long day of sightseeing it is nice to come home to a home instead of a room in a motel. The host made us immediately feel at home showing us around the house and then to our bedroom which was very comfortable. He recommended a nice waterfront restaurant that had an excellent and reasonable menu. Upon our return, we sat around the living room and met other guests (from California and Texas) as they returned from their busy day. Internet access allowed us to check our email. We ate a delicious breakfast with the Texas couple in a comfortable dining room with a fire on the fireplace. We were pleasantly surprised by everything. Cute house, beautifully restored and with nice antique pieces, clean, soft and comfy sheets and towels in the bedroom. They even provided his/her bathrobes for us and mints! The hosts were helpful, kind and accommodating (we overslept for b-fast, and they still served us a lovely meal). Peach toast was new for me, and apparently their own special recipe,(a real treat!) but the ginger and cranberry scones rocked out as well...the best I've ever had by far! The hosts were able to suggest good places to eat and gave us detailed directions to the Beacon DIA and the very close-by Storm King Sculpture Gardens (definitely two art experienes that made this trip even more AMAZING). The only negatives were the couple next door that talked louder than necessary, and a shower head with low water pressure, but besides these, it was a delicious and romantic little holiday. My boyfriend and I spent a wonderful evening at the Caldwell House. It's a beautiful, historic house (I will let the curious find out more about the history, the hosts are happy to share stories). The new owners are extremely warm and accommodating. Also, there are SO many activities in the area to complete your Hudson Valley getaway: Storm King sculpture park, numerous hiking options in Harriman State Park, local farmer's market, etc. I had a truly lovely experience at Caldwell House. It was the perfect balance of peace & quiet and enjoyable conversation. Not to mention food that I'll be thinking about wistfully with every bite of plain tuna sandwich or Chinese takeout I eat for the next few weeks! If I know anyone heading up to the area, I will most certainly point them in your direction. We enjoyed a terrific weekend at Caldwell House over Easter Weekend 2012. The room we had was well appointed and very comfortable. Our hosts, John and Dina were very attentive and helpful. They steered us to many of the local sites. We really enjoyed the terrfic breakfasts! We'll look forward to returning since we loved the fact that it was centrally located to many area attractions. We enjoyed the two dinners we had at Laughran's that was literally a two minute walk away. This was our second stay at the Caldwell House and it will not be our last. John and Dena are outstanding hosts. They are kind and very accommodating. 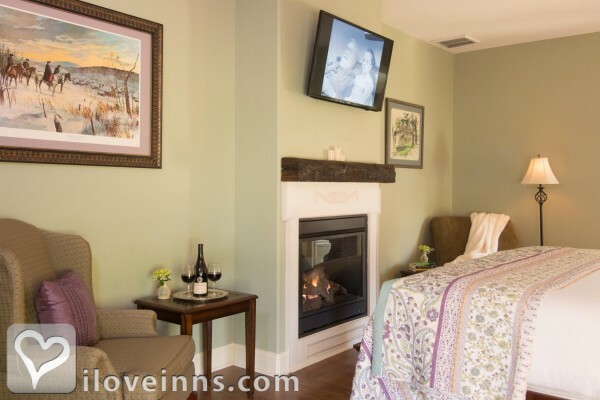 Staying at the Caldwell House is like staying with family you �like�. This time we stayed in the Trophy Point which is in the Carriage House. The room is upstairs and very large. The king size bed was very comfortable, There is also a chair and loveseat in the room. A flat screen TV with Netflix and HuLu kept us occupied when we were in the room. The shower is like a room itself. Breakfast was delicious. There is always fruit and plenty of coffee, tea, and juice. The conversation was as good as the food. Dena made an oatmeal that was so good she should sell it in the supermarket. Thank you again for a fantastic stay. We will be back in a few months. We had a wonderful stay for our anniversary at this beautiful bed and breakfast. 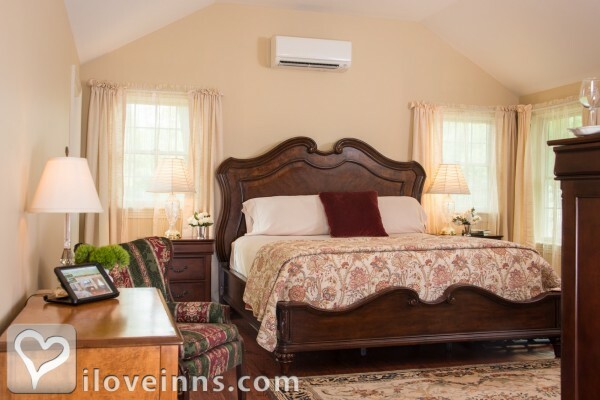 John and Dena are lovely innkeepers who make you feel right at home. This past weekend, my husband and I celebrated our third year anniversary at the Caldwell House Bed and Breakfast in Salisbury, NY. It was the first time that either of us had ever been to a bed and breakfast, yet it was an experience that we will never forget. It is a striking historic home. Besides the fact that the innkeepers, Mama & Papa Finn, are some of the friendliest people that one could ever meet, the house and rooms were immaculate. Breakfast was PHENOMENAL�so much so that I had to stuff my purse with recipes!  During our weekend stay, we visited West Point, Brotherhood Winery, and the Premium Outlets�which all very close points of interest. There was a full house. Being the last to leave, I was amazed to see that ALL of the other friendly guests were just as pleased as we were. Each guest left with a smile, offering extra praise. Whether or not you have been to a bed and breakfast on a previous occasion, visiting the Caldwell House is a MUST! It truly deserves each of the FIVE stars granted. John and Dena are fantastic hosts and promptly attended to our various needs. We stayed for my sister's bachelorette party. They set up wine tastings with a limo to take us to 4 of the best local wineries and set up a spa day at the local salon. They have fantastic recommendations for local restaurants as well. The rooms were spotless and charming. I would highly recommend this to anyone looking for a relaxing getaway in a friendly atmosphere. The Caldwell House is a beautiful Bed & Breakfast. Dena, John & Megan made us welcome and feel at home. They serve a DELICIOUS three course breakfast every morning. The rooms are beautiful and very very clean. Hope to vist the inn again. Drove us from and back to the train station. Beautiful house with great rooms. Extremely nice and great breakfast. All in all a wonderful stay. My husband and I stayed at the Caldwell House the weekend after Christmas as a kind of retreat from the kids after a hectic week. Caldwell House and Deanna and John were amazing. From the convenient location to Long Island, to the amazing breakfast and hospitality to the beautiful surroundings and impeccably clean and well appointed rooms we were impressed and satisfied customers. We felt like we were part of the family. Will be sure to stay again. Caldwell House was the perfect spot for a weekend reunion with friends. This beautiful house is a delightful place to relax! Dena, John, and Meagan are the quintessential b & b hosts, providing for everything we could want, not the least of which was a delicious breakfast. The area has plenty to offer. We had a fun afternoon at Brotherhood Winery just a few minutes away. There are some great riverfront restaurants in Newburgh and a fun Irish pub within walking distance. We will be returning to Caldwell House, no doubt about it! Five stars all around. My husband and I just returned from our most recent stay at the Caldwell House B&B (we stay there when we visit family in the area). While I haven�t written a review before, I felt compelled to do so after our most recent stay. We simply LOVE the place and the hosts, Dena and John are wonderful. Each time we stay there seems to be something new about the B&B. We first stayed there not long after Dena and John took over. The changes they have made to the House are well thought out. They have turned what was already an extremely nice B&B into a world class Inn. They have added all sorts of modern conveniences (iPads, wall mounted flat screen TVs, Blu-ray players that include Netflix) while maintaining the charm of a beautiful 200 year old home. They are nearly done with the construction on a new room, which we cannot wait to stay in. What they have already done (they�ve redone front porch with beautiful wood, added ceiling fans and new furniture, a beautiful new stone patio on the side of the house, and tons of new landscaping) and plan to do to the grounds is amazing. They really pay attention to the details! Oh yeah, and then there is breakfast. I don�t think we have ever had the same meal twice despite having spent at least 10 nights there. It is all so delicious and the portions are quite generous. It never seems to matter whether the house is packed or we are the only couple there, somehow Dena and John make you feel special. The Caldwell House has gone from being a B&B that happened to be close to our family to a place we can�t wait to go back to �and, oh yeah, maybe we will visit our family, too! My husband and I had the best time at Caldwell House! The room was incredible, the hosts (Dena and John) went above and beyond to make our visit perfect and the breakfast alone was worth the nightly rate! We can't wait to stay there again. We chose to stay at Caldwell House the night before the West Point Triathlon instead of one of the local hotels in Newburg. We realized we wouldn't have a lot of time to enjoy the house because of all the things we had planned to do in the area, but we decided to stay there anyway because we knew it would be a great way to relax before the triathlon. We're certainly glad we made the decision! We arrived Saturday afternoon and received a warm welcome from John, who gave us a short tour of the house before taking us to our room. When we explained that we needed to leave for the triathlon by 7:00 am and would miss breakfast, he immediately asked Dena what could be done to help us out. She quickly told us that she would make a parfait with yogurt, fruit and granola and leave it in the refrigerator. John then showed us where to store the bike for the night and printed out a map with directions to the start of the triathlon. Our short stay was definitely off to a great start! After we settled into our room Saturday afternoon, we decided to head to Woodbury Commons for some outlet shopping. Before we left, Dena armed us with a voucher for a discount coupon book...and insider information about the best place to park. We grabbed a few treats from the parlor before we left and then set out for the mall. Sunday morning brought and early start for us. (Thank goodness there was coffee in the parlor!) When we went to the kitchen to get our breakfast, we found a goody bag in the refrigerator with two generous servings of parfait, along with brownies, water and bananas. Needless to say, we wished we were going to be around for Dena's renowned breakfast that we'd read about, but her goody bag was a pleasant surprise and definitely filled us up! When we returned from the triathlon, John and Dena had just left for church so we freshened up and prepared to depart. Meagan made sure we knew there was no need to hurry and asked if there was anything she could get for us. A bottle of water sounded really good, so the lovely young lady helping Meagan clean the rooms got a couple from the refrigerator as we were leaving. Needless to say, the hospitality we received at the Caldwell house continued right up to the very end of our stay! We hope to travel to the lower Hudson Valley more in the future and will definitely consider staying with John and Dena again...if nothing else than to enjoy that breakfast we missed out on this time! We only spent one night at the Caldwell House, but as we left, we wished we had more time to spend there. Dena and John are wonderful hosts, welcoming us with warmth upon arrival and spending quite a lot of time telling us the house�s history, talking about renovations they had made and making recommendations for local activities and food options. The house itself is circa 1800 and is full of interesting materials and antiques. John and Dena keep it immaculate and the guest rooms are all large, comfortable, private, quiet and have private, individual bathrooms. If you must remain connected, they have wifi and excellent TV options (including a flat screen) in each room, but truth be known, we didn�t use any of that. We were just enjoying the peace and quiet, the comfort of the bed and sitting areas and the adventure of staying in an amazing old building. Loughran�s next door proved to be a very good place for dinner and our fellow guests also had good things to say about Bella Luna just down the road. Dena�s breakfast in the morning was outstanding and sent us all off into the day pampered and smiling. 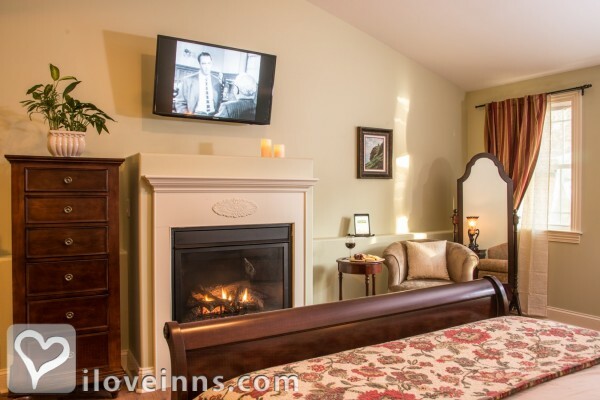 In all, Caldwell House is an excellent choice for spending a night or much longer and Dena and John will make sure you are comfortable, happy and well taken care of. 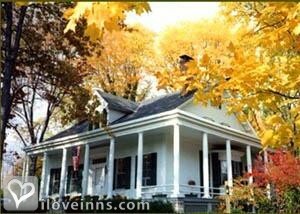 The Caldwell House Bed and Breakfast is perfect for a romantic getaway! John and Dena are extremely hospitable hosts and are always there if you need anything. The quiet area provides a perfect break from the city life and makes you feel like you are truly on vacation. After only 2 days here we felt extremely renewed! I would highly recommend this bed and breakfast. It is worth every penny! Let me start by saying, when we arrive we were greeted by Dena and she immediately made us feel at home. She took us on a brief tour and showed us our room. We stayed in the Harmony Hill Room. The room was well decorated, loaded with technology, and simply comfortable. The bed was top quality. They even had a I-Pad in the room for our use. They thought of everything. Aside from the amenities of the room, the house itself was beautiful. We did not spend a lot of time in the common areas due to our our schedule. I can't say enough about John and Dena, the hosts. They made us feel like family. They made sure we were comfortable. The breakfasts were fabulous. Sunday we had Gingerbread French Toast. That alone was worth the trip! If you are thinking about staying in Orange County, NY, there is nothing to think about. Stay at the Caldwell House. If it is not available on the dates you want, change your dates. It is that good. Thank you for a wonderful weekend! Five Stars for John and Dena! This past New Years, I stayed at the Caldwell House Bed and Breakfast. Although I have been a guest several times in the past, I figured it was time to write a review. John and Dena are spectacular hosts and their professionalism, and welcoming personalities truly made my stay even more remarkable. When I arrived, they brought me throughout the main house of the B&B to give me a tour to see the new (and beautiful I might add) renovations! The room I stayed in, "Tressel", had the most comfortable bed I have ever slept in, I was amazed! The room, bedding, and bathroom were especially clean. The housekeeping staff, whom I also met, were very friendly and accomodating. I also find it unique how every room had an iPad in it. It made making plans for new years, finding restaurants, and figuring out directions easy when I was relaxing before bed. The amazing hospitality, Dena's decadent food, and the unparalleled service and comfort John, Dena, and the staff of the Caldwell House provided are a few of the reasons why I tell all of my friends and family about it. John and Dena run an amazing business, and the success of the B&B is an outstanding reflection of their hard work, dedication, and passion for the industry and their guests. 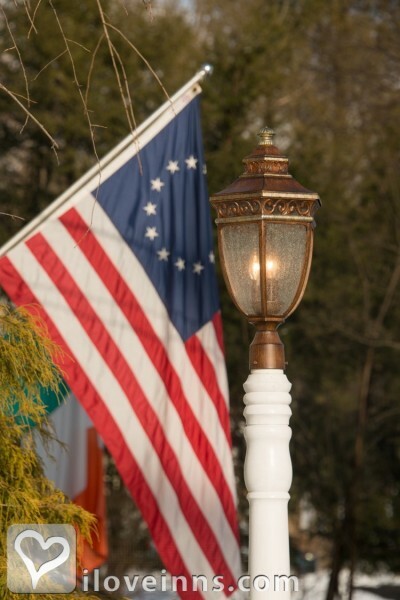 If you have not stayed there before, it really is essential for you are missing out on one of the greatest B&B experiences in the Hudson Valley! Excellent job John and Dena - keep up the great work!! 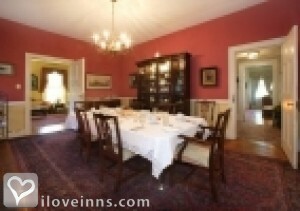 We look for a romantic place to celebrate Valentine's Week and the Caldwell House was a winner. John and Dena went out of there way to make our stay special. We stayed in the Harmony Hill Room which included a fireplace in the bedroom and the bathroom. The two person jacuzzi bathtub and flat screen TV in the bathroom were a nice bonus. Dena's three course breakfasts were outstanding and they were different each of the three days of our stay. We also enjoyed the special treats that were available during the day. Dena's home made valentine cookies for our ride home was another romantic touch, We will go back for another visit. My husband and I stayed one night at the Caldwell House to escape the craziness of life. It was a much needed stay of peaceful relaxation. We stayed in the Harmony Hill room- what a beautiful treat! With the fire place, cozy king size bed, massive spa tub and private balcony, it was hard to leave. The owners, John and Dena, were extremely welcoming, inviting us into their home as old friends instead of strangers. Breakfast, oh that was a delight. Dena satisfied our palates with a fantastic spread of homemade bread, egg pizza, poached pears with raspberries, bacon, and plenty of coffee and juice. 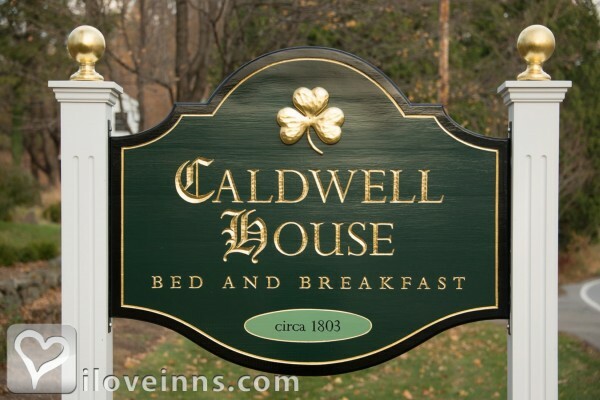 I wished I lived closer to invade the breakfast hour on a daily basis, We cannot wait to visit the Caldwell House the next time our journeys find us in the Hudson Valley. My wife and I stayed at the Caldwell House while visiting West Point. The house was clean and in immaculate condition. I think they have struck the perfect balance between modern amenities with historic charm. Dena is an outstanding cook, and I would say her breakfast alone was nearly worth the price of admission. John has a fascinating background, and he was incredibly humble and accommodating. I whole heartedly recommend the Caldwell House. Dena and John were helpful from the get go, when we relayed our dietary restrictions. 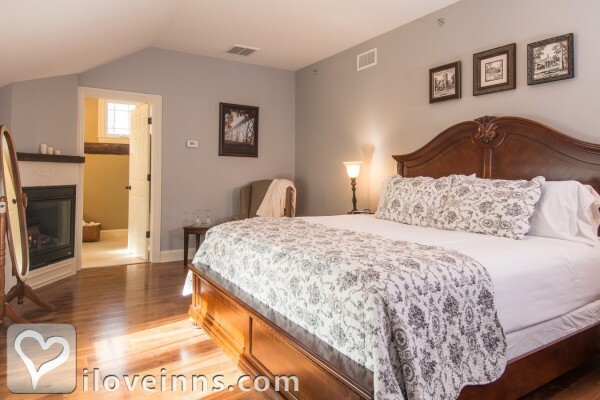 The inn was immaculate and tastefully designed. We loved the little touches, such as the teddy bear "baring" a welcome message as well as the chocolate mints on the pillow. It felt like being a guest at the home of old friends. 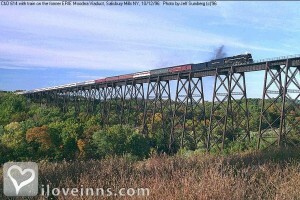 We hope to return in the fall to enjoy the foliage. 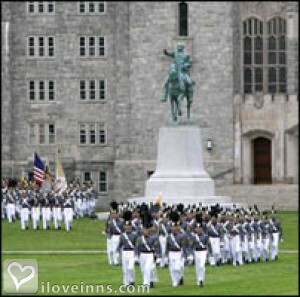 Our family stayed at the Caldwell House for our son's graduation from West Point. Dena and John were absolutely wonderful. I can't imagine a more perfect week. They took all the stress and details off my shoulders and the week was a memory like no other. The Caldwell House is the most charming and cush B&B we have stayed in and loved it so much, I went back 2 months later. The owners and staff are so friendly and Chef Dena caters to special diets with a smile. Magical and must be on everyone who loves charm's, "Bucket List!" Our kids surprised us at Christmas with a gift certificate for a stay at the Caldwell House. We went in spring, and boy, were we pleasantly surprised! From our first warm welcome from Dena we knew we weren't in a typical B&B...this was a special place. Based upon a wonderful three day stay, we have booked a return visit for September. The B&B complex is well maintained and pleasing to the eye. More importantly, John and Dena are thoughtful, caring, and informative hosts who will add to your enjoyment of their magnificent B&B. Dena and John have planned and provided for virtually any guest need or request. For example, there are wine glasses and corkscrews in the room, fire logs within arm's reach, showers equipped with shampoo, conditioner, and soap dispensers, snacks, treats, coffee and tea readily at hand 24/7, a backyard couples swing, and a wonderful front porch perfect for reading, conversation, contemplation, wine sipping, etc. Moreover, Dena and John are easily available to help plan a day of sightseeing or shopping or to recommend a favorite restaurant. Dena provides a delicious sit down breakfast at 9 am, served on a beautifully arranged table, complete with a menu listing the names of every guest. This delicious meal, about an hour in duration, leads to some delightful conversation among the guests that is further enhanced by John's presence. He is a great resource for local history and events, and is a fine storyteller to boot. Even if you are running on a tight schedule, you should not miss Dena's breakfast. Give the Caldwell House a try. We believe you will enjoy it! 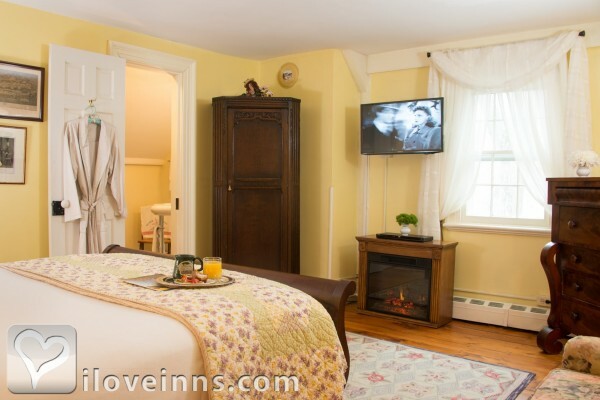 We like charming B & B's and yet enjoy modern conveniences. Also great breakfasts and charming hosts are appreciated as well. Caldwell House definitely rates. We stayed in the Cannemara House which is their newer addition. Very, very nice room with beautiful bathroom. We were there for a family wedding which filled up the place. We saw many of the rooms in the main house and they were very charming with wonderfully updated bathrooms. Dena could not have been more attentive and flexible besides also serving great breakfasts. We would strongly recommend this B & B! Everything about the Caldwell House is executed to perfection. The atmosphere is completely serene and there is so much to do that is really close by. There is a hiking trail in walking distance, Sugarloaf shopping just a 10 minute driving away, great restaurants, Storm King art center. We absolutely love this place and have made it our home away from the city whenever we can scoot out for a few days. John and Dena are the kindest hosts we have ever experienced, breakfast is AMAZING. 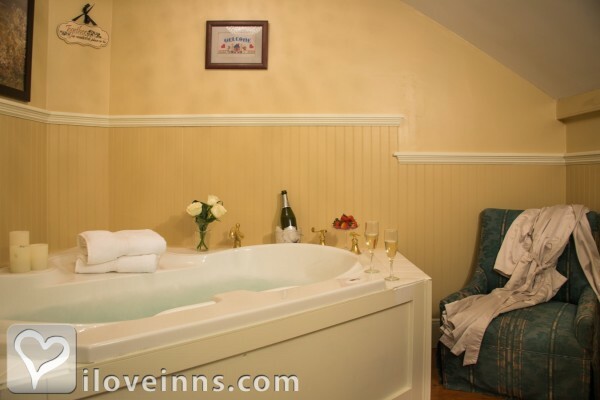 The house offers lovely room choices and romantic details like fireplaces and soaking tubs. I make friendly with the hammock which is so cozy and beautiful to watch and listen to birds. Really special getaway. We stayed at Caldwell House for a family wedding nearby. The high standard of the accommodation and the period design of the site was full of character and charm. It felt like George Washington was going to walk through the door! Dena and the team were very hospitable and John was very knowledgeable about the history and geography of the area. The bed was comfortable and the Jacuzzi bath was much appreciated! There were goo seating areas throughout the garden and a veranda from which to admire the scenery. We stayed 5 nights at this beautiful bed and breakfast in the Hudson Valley. Beginning with making the reservation, everything was professional, accurate, and helpful. What makes this place even more special is the friendly, warm, and welcoming hosts, Dena and John. From check in to check out, they provided tourist information, history, restaurant recommendations, and suggestions to make our vacation even more enjoyable. This is a perfect place to anchor yourself while exploring the Hudson Valley; everything we wanted to do seemed no more than 45 minutes away. Other staff were always ready to help or advise. The grounds are beautifully maintained and the breakfasts were delicious. Nice touches in the room include snacks, drinks, mini refrigerator, smart tv, and wifi. Wow!!!!! We stayed in the Storm King room at the Caldwell House. This room is not cheap, but there is a good reason for that, it�s beautiful!!! The whole property was manicured and quiet. Our room was immaculate. Attention to detail could be seen everywhere. Food was great. Owners were very friendly and helpful. Every attempt was made to make our stay a memorable one. Common areas were stocked with complimentary snacks and beverages, in room desserts in the evening, bathroom huge with Jacuzzi tub and modern fixtures, fireplace, luxurious bed and its 20 minutes from West Pointe. Well worth the $$$. If you want to indulge yourself for a couple of nights, this is a lovely place to do it. Ahhhh!!!!! My husband and I stayed at the Caldwell Bed & Breakfast for two nights for a much needed rest. We stayed in the Antrim, which is in the main house, and it was wonderful. The room is beautiful with a nice fireplace. Bathroom has a nice big rain shower and robes are supplied, so you can wrap yourself in one when you come out of the shower. All the rooms are equipped with a flat screen TV, Wi-Fi and an iPad for your personal use. There�s a small pantry with coffee, tea, hot chocolate and little things to nibble on, if you so desire. The porch, in the main house, has nice comfy chairs and the common areas in the main house are great to putter around in. I enjoyed having a cup of tea and just looking through the books and magazines that are there for you. If you prefer a glass of wine, you can do that also. It just felt like home. On our first evening my husband and I smelled something delicious baking. I thought, wow, what is Dena making? Can�t wait for breakfast to see what she made. That evening when we got back to our rooms, there were two pieces of homemade apple pie waiting for us. What a treat. It was delicious, and such a nice touch. Dena is a great cook and a gracious hostess. Dena and John are there to make your stay as pleasant as possible, and they do. We will definitely go again. Oh, I almost forgot. 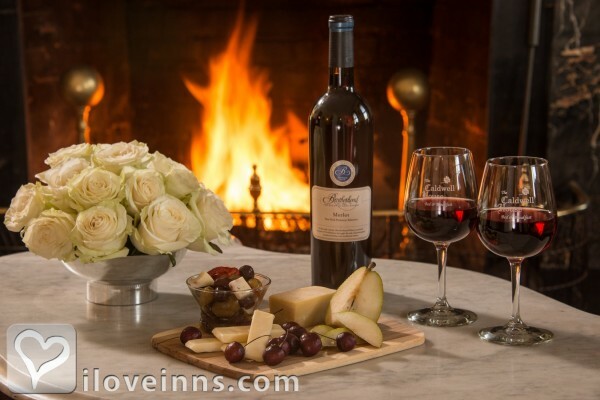 If you�re wondering where to have dinner, we had great Italian food at the Bella Luna, which is only about four miles away and the best French food, which is on par with French restaurants we�ve gone to in NYC, called the Vinum, which is about two miles away. I think we need to make this place our home away from home at least twice a year! Can�t wait for our next visit! Very comfortable and relaxing, lots of privacy but opportunities to chat with interesting guests. 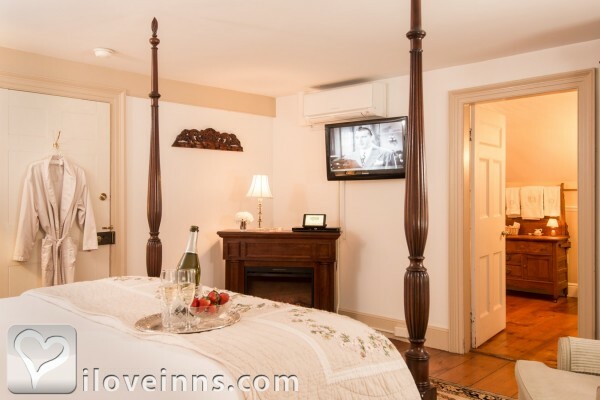 Soft sheets, fireplace in room, cozy robes, wi-fi and flat screen TV and beautiful period decorating. John and Dena are warm and welcoming. Our organization had a couples retreat here. Dena has proven she knows how to execute to perfection for large groups; and even for groups like our small church. She has obviously taken customer feedback to heart; and has incorporated thoughtful elements that brings a quaint and comfortable feeling.....she has thought of virtually everything. My wife, who is very particular, absolutely loves the place! I will definitely keep this place in mind for corporate gatherings. Lovely people who care about making your stay great. Clean, bright, COMFORTABLE room (Rock of Cashel), very pretty grounds where you can relax in peace, tasty breakfast and even free treats like chocolate, drinks and granola bars! We thoroughly enjoyed our third stay. Dena and John do an amazing job of making everyone feel welcome, comfortable and well cared for. Once again we had a peaceful getaway in our beautiful, clean room with every amenity needed for a relaxing, romantic weekend. The breakfasts are just delicious and keep you full until dinner. It's situated in an area that feels world's away, but is easy to get to with plenty of nice restaurants and activities. Can't wait to go back! Absolutely amazing stay and beautiful for our wedding ceremony! We just came back from a last minute overnighter and had a great time. Very relaxing. The rooms were beautiful. 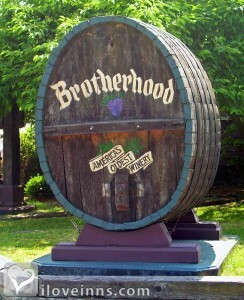 The location is very close to Brotherhood WInery and walking distance to a nice Irish Pub. THe Inn owners were warm and welcoming. Highly recommend. Stayed in the Butter Hill Room in the main house on October 27. Owners live in a house next door so this really does feel like an inn and not someone's home. Rooms are extremely comfortable, with each having an I-Pad, slippers and robe. You won't be at all disappointed and will wish you could stay longer. Place is beautiful, service great and friendly and the common kitchen area with snacks and drinks makes the place feel like home. Plenty to do in the area. John and Dena, keep up the great work. Very romantic B&B! We had an amazing time at the Caldwell House B&B! John and Dena were extremely hospitable and made us feel right at home. Breakfast was delicious and the room was beautiful. The location was perfect for exploring the Hudson Valley. The lower Hudson Valley's only Select Registry. Awarded BedandBreakfast.com's Diamond Collection Status. Trip Advisor Certificate of Excellence 2011 - 2015. 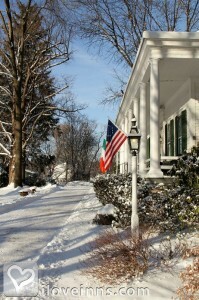 Voted Best Bed and Breakfast in the Hudson Valley by readers of Hudson Valley Magazine, Orange County Post, New York Post, Cornwall Local, News of the Hudson Highlands, Arrington's Bed and Breakfast Journal, Inn Traveler Magazine (2005 Best Breakfast New York State), http://newyork.cbslocal.com/top-lists/outside-nyc-bed-breakfast-inns-of-hudson-valley/, http://newyork.cbslocal.com/top-lists/outside-nyc-bed-breakfast-inns-of-hudson-valley/, Hudson Valley Magazine (2006), Winner Best Bed & Breakfast in the Hudson Valley (2008), NYS Hospitality and Tourism Association B & B of Distinction (2008).